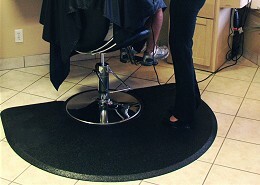 Our high quality Ortho TUFF Skin Professional Salon Mats provide comfort for all areas of the salon. We offer a variety of sizes and shapes to provide the most behind-chair working area than any other salon mat. Bleaches, peroxides, hair, and products are easily wiped clean. Ortho TUFF Skin Professional Salon Mat is the ultimate anti-fatigue solution for professional salons. This orthopedic wonder works well in all areas of the salon. Permanent hair color, bleach, peroxide and other chemicals can easily be wiped off with acetone. Custom Sizes Available for additional usage areas.